Microsoft provides a Metro style control panel to personalize the color scheme of accounts on Windows 8 but never provided an interface to customize the lock screen colors where you select accounts and log in. The lock screen colors can be customized just like the rest of the Windows 8 Metro interface but you must edit the registry. Log into any account with administrative rights on your PC. Open the Start Screen and type in regedit and hit Enter. Navigate through HKEY_LOCAL_MACHINE, SOFTWARE, Microsoft, Windows, CurrentVersion, Explorer and then Accent. 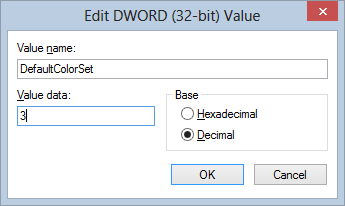 Create a new DWORD called DefaultColorSet by right clicking on Accent and select New and then DWORD (32-bit) value. Right click on your new DefaultColorSet entry and select Modify. Pick a color scheme from the graphic above and note the corresponding decimal value. Switch the base to Decimal on the Modify screen and enter in the value you want according to the chart.